Life often takes us by surprise. The unexpected happens and leaves us feeling frazzled or fearful. We might become angry, disappointed, dejected, or even panicked. But remembering that nothing surprises God changes everything. We ought to find consolation in knowing that God doesn’t wring His hands and fret when the unexpected strikes: “Oh my goodness, look at what’s happened to that woman! How did that slip past Me?” That’s because whatever happened wasn’t a surprise to Him. He knew it was coming, and He was aware of every detail before it unfolded. • “But I know that the king of Egypt will not let you go unless a mighty hand forces him. So I will raise my hand and strike the Egyptians, performing all kinds of miracles among them. Then at least he will let you go. And I will cause the Egyptians to look favorably on you” (Exodus 3:19-21). The little phrase “God’s got this” applied to Moses, and it applies to us today. 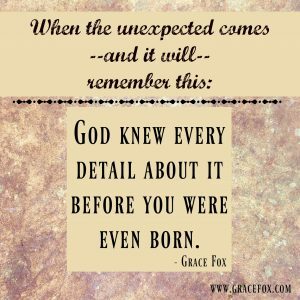 When unexpected comes—and it will—remember that God knew every detail about it before you were even born. It was no surprise to Him. Trust Him in the midst of it, and with the outcome. He’s got your back. Thank you Grace this speaks loudly to me right now. So good to be reminded of our Heavenly Father’s watchfulness over us and his unfailing love and faithfulness. God bless you! Hi Debbie. 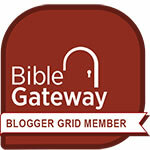 Where, oh where, would we be without God’s watchful care and wisdom and sovereignty? Lost and without hope. God knows. He cares. And He’s with us. I find such reassurance in these truths. Have a great weekend. And know you are loved. This was the perfect word for me today! January 2017 has not turned out like I planned at all due to some health issues but I will put my hope and trust in God. So thankful he has my back!! Thank you for stopping by and leaving a comment. You are soooo not alone in experiencing a change in plans already in 2017. But none of this has taken God by surprise. Carry that truth in your heart, and thank Him for walking this path with you, and you’ll experience His peace. Know you are loved.